Calling all potential magical beings! Have you ever picked up the phone before it started ringing? Do you have a sixth sense for beings lurking in the shadows? If so, the Gatekeepers Guild needs you! 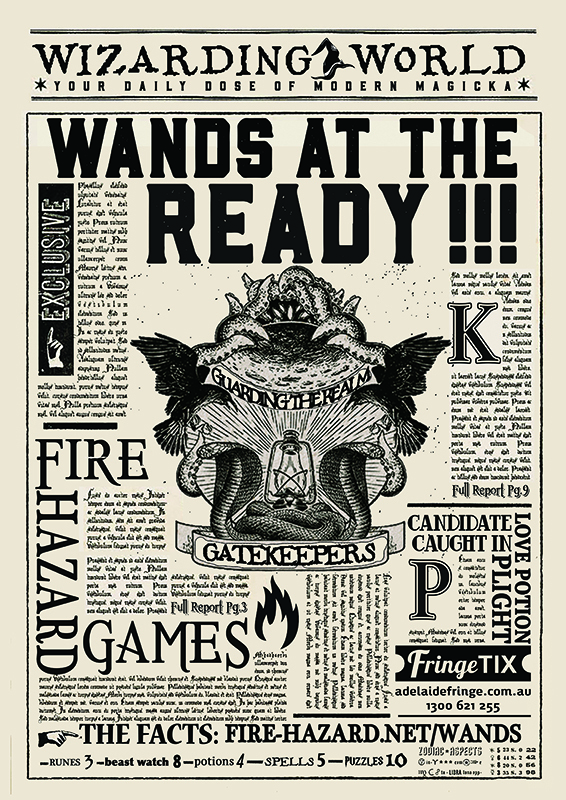 ‘Wands at the Ready’ is a crafty spell-casting adventure through the magical underworld of Adelaide’s streets. Track and translate runes, embark on spellbinding side quests and avoid roaming wraiths. For centuries, the Gatekeepers Guild has stood watch over the realm, protecting both magic users and non-magical beings alike. However, the ranks of our fair guild are thinning, a dark presence convalesces in the shadows, and we require an influx of fresh blood to keep the streets safe! Throughout the city of Adelaide exists a series of mana pools which serve as portals for those who are attuned to magic. These wellsprings of power are vulnerable to misuse and could be used for nefarious means, should they fall into the wrong hands! Those amongst you who have dreamed of standing watch with the brave men and women of the Gatekeepers Guild, please attend a mandatory recruitment session on one of the four available assessment weekends. Applicants will be required to pass their W.A.N.D (Wizarding Assessment of National Defence) in order to be considered. A predilection to challenges, riddles, puzzles and code cracking. A competitive spirit, not all are suitable for the guild! Only the best will be considered. Firstly, reserve your assessment slot here. Please arrive at our temporary guild headquarters at The Historian Hotel between 2:30pm and 3:00pm. Punctuality is imperative for Gatekeepers! Wear clothes which allow you to walk, move, cast spells in and track magical beasts comfortably. As the saying goes: dress for the job you want! We are favourably inclined to those who undergo assessment in their robes. Bring your own electronic scrying tool (AKA smartphone) in order to communicate results back to headquarters and keep track of your results. Don’t try this alone! Please assemble your own questing party of 2-5 magii and register your interest. If successful all applicants will be eligible for a position within the guild. Teamwork is a valuable skill for Gatekeepers. How does the assessment run? New recruits will meet at The Historian Hotel where experienced Guild Members will greet you. You'll pick up your wizarding assessment kit, which contains a map, protective amulets and rune translation sheet. Once the Archmage has given the briefing, teams will have about an hour to accrue as much mana as they can. You will need to find rune tablets to translate and side quests to complete by following our web app on your scrying device (smartphone). The Archmage will provide access details upon your arrival. At the same time, you'll need to watch out for any roaming wraiths. They don't need to catch you - if you get too close they'll drain your mana, so it's best to keep your wits about you. You will have about an hour to demonstrate your skills, before we meet back at The Historian Hotel to swap stories, award commendations and initiate successful applicants. How much running is there? As much as you want; we've deliberately designed the assessment so that stealth, cunning, good teamwork and solid map-reading are just as important as speed. All magical beings bring different skills to the guild, so we encourage each applicant to work to their strengths. That said, you'll want to ensure that you can walk, move, cast spells and track beasts without restriction, so ensure your clothes allow you to move comfortably. Comfortable walking shoes and at least one fully charged smartphone per team (preferably with its own data - as the free wifi networks available can be unstable). We can look after your bags if you need us to. Can I stick with my friends? You can form your questing party once you have tickets and arrive at the venue - even if you buy them separately you'll be able to join together for the assessment. For the best experience, we recommend teams of 3 - 4 recruits (though we allow party sizes up to 5 players). If you have a larger group, we suggest that you split up and compete in smaller teams. Sure, as long as they're in a team with an adult who's taking responsibility for them! We've had young kids play our other games and although we often find that magical ability does not manifest until children are a little older, we are sure they will enjoy themselves nonetheless. We play in public spaces that aren't entirely traffic-free and we don't supervise teams at all, so do use your judgment. Children aged 8-17 are welcome to play under concession tickets. For younger players, please email us in advance. Short version: Yes, but please email us first if you have any specific questions or requirements. We normally start in The Historian Hotel, which is accessible. You'll need to move around the streets, Rundle Mall and surrounds fairly continuously, although not necessarily quickly, for about an hour. Some of the rune tablets might require reaching or crouching, so it would be useful to have a teammate who can locate and read those. Drop us a line at adelaide@fire-hazard.net.